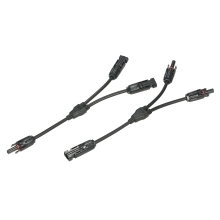 These Y-Branch MC4 compatible connectors are designed to connect solar panels between solar panels and extension, which is a perfect solution to parallel connect multiple panels together in a solar field, and is typically used in parallel applications. Y-Branch MC4 solar panel cable connectors, suitable for PV system. The O ring is perfect to seal out water and dust to prevent corrosion. Compatible with PV cables with different insulation diameters. With excellent aging resistance and UV endurance, it can be used in harsh environment. Resistance of extra high & low temperature and fireproof. Load capability with high current and high voltage. Quick & simple assembly and simple removal of plugs without the aid of any extra instrument. Great solution for parallel connection of multiple panels together in a solar field.